The Thames Valley gets its name from the famous River one sees running through London. It meanders from there through the countryside. During Henry VIII’s time the river provided an alternative route to his country homes, namely, Hampton Court Palace and Windsor Castle. This area has 5 counties, or shires as they are known in the UK, with the two best-known cities being Windsor and Oxford. The area is packed with historic sites and wonderful stately homes and gardens some of which you can tour and others having been converted to country home hotels in which you can stay. Everything is in easy driving distance for day trips, however, should you choose to move around the valley trying different country house hotels, you can do that too. The Thames Valley is a good touring area from a driving perspective since it is the closest country area in the proximity of Heathrow airport. And do remember that the British drive on the left. Sometimes when you embark on a new driving mode it is better to not go too far that first day. If you are arriving from Gatwick check back for our coming section on the Downs for hotels and touring from there. If you are arriving from Heathrow, Windsor is a good place to base yourself. You can do day trips throughout the area from here. For the country home experience we recommend either the Christopher Wren House Hotel in Windsor or the Oakley Court Hotel just outside of the city of Windsor. The Christopher Wren House was the original home of the famed architect who built St. Paul’s in London. It is located right on the river in good proximity to the many sites, shops and restaurants of Windsor and Eton, and lovely view of the river and Eton. Ask for the room with the walk out porch overlooking the river. If you are there during the school terms you will see the Eton boys rowing and the graceful swans floating on the Thames. If you prefer to stay a short distance out of the city, Oakley Court is lovely. The detailed plaster work, fine architectural details and cosy fireplaces put you in the mode of the true country experience. Their high tea in the afternoon is very well done. And, in the evening relax with your favorite drink in the richly panelled English bar or out on the terrace overlooking the gardens and the river, then on to a delicious dinner in the fine dining room, followed by coffee and desert in one of the many superbly appointed sitting rooms. After dinner it’s off to your bedroom for a good night’s rest. Windsor has many activities going on throughout the year to add to your enjoyment. Should you arrive in mid June it’s a great location to stay and attend the famous Royal Ascot races nearby, in May, it is the home of the Windsor Horse Show, both of which the Queen attends. And in September, the Windsor Festival of the Arts goes on for two weeks of music, literature and theatre. Each of these events will go a long way to immerse you into the culture and feel of life in the country. Don’t be put off, if you are not into horses, ladies day at Ascot will be something that you will remember forever but don’t forget that special hat which can be bought at Caley’s on the High Street. The Windsor Horse Show also has something for everyone. You can easily spend more than one day in Windsor itself, depending on your time. Windsor and Eton are two picturesque little cities facing each other on the River Thames. We think Windsor is the best little city in the UK, but then we live close to it and it holds a special place in our hearts. It is steeped in history, interesting architecture, and a charming plethora of shops, good restaurants and a top-notch theatre. Of course, the jewel of the town is Windsor Castle. It was built in 1070 by William the Conqueror and has been modified by many monarchs through the centuries reflecting their taste; an exhibit on the way in gives you a detailed description of these modifications. The state rooms are exquisite and the art, architecture and antiques are among the best in the world. Don’t pass up Queen Mary’s doll house on the way in; it’s the most intricately detailed doll house you will ever see. And as you stroll the grounds do tour the moat gardens if they are open, you can get some great photographs in this area. St. George’s Chapel and the Albert Memorial chapel were built back in the 1500’s and are outstanding examples of late gothic works. As you leave the Castle, walk straight ahead down the cobbled stone street to some fine shops showcasing English products like Moorcroft pottery, Scottish sweaters and shortbread, English China and more. As you come around the block you’ll be heading back to the High street, to your left is the Guildhall designed by Sir Christopher Wren and the recent location for Prince Charles’ wedding. To your right is the statue of Queen Victoria, continuing down the High Street you will find the train station shopping area. This too is a great place for English products, especially in the little market place. It’s also a great place for lunch, if you like French there’s the Cafe Rouge, if you like Italian there’s Carlucci’s and if you’re into Spanish there’s the tapas restaurant. The HaHa Cafe is worth a peak inside and a cup of coffee or lunch, it’s the site of the original train station. As you exit the train station turn left and head down the High Street to the first street where you turn left again and go straight to the river Thames. On a nice day a walk along this river with it’s graceful swans is a relaxing and scenic diversion. As you look to the other side of the river you see Eton, home to one of the most famous schools in England, Eton College. Also in this area you will see boat tours for 1 or two hours down the Thames, a great way to get a feel for life along the river. The two hour tour takes you on a romantic meander down the leafy riversides through the locks and down to the stately country house hotel Oakley Court featured in many movies. One of the best pictures of the Castle can be taken on these boat trips from the water. Cross the bridge to Eton and you will be on the High Street there on the way to the College. There are several antique shops here and an assortment of collectible shops and restaurants. If Eton College is open for tours it is great way to see the campus. The history of the college and the famous people who went there is fascinating. The Chapel at Eton has some of the finest Burne Jones tapestries you will ever see. If the tours are not running stop by the museum of life at Eton College for a shorter peak into history. Going back to Windsor, another good shopping street is Peascod Street, which runs perpendicular to the High Street at the Castle. If you continue up the High Street away from the River you will reach the front view of Windsor Castle and the Long Walk. 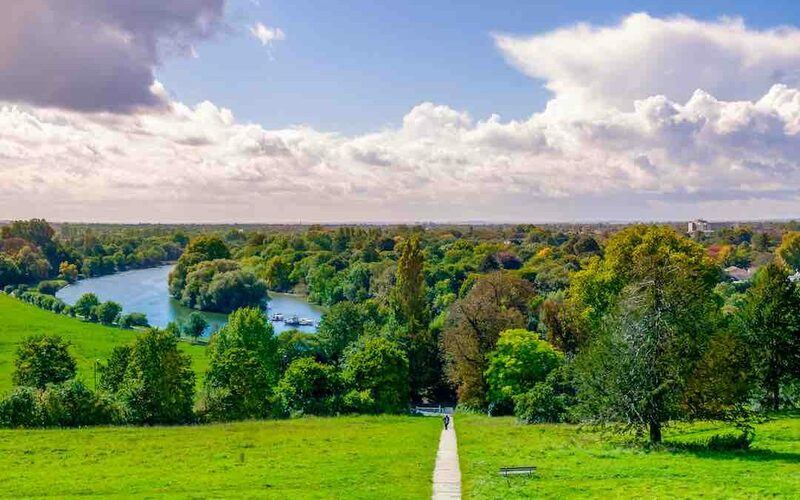 This is a wonderful tree lined walk that goes to the Great Park and to the Frogmore area where Queen Victoria’s mausoleum, and the Frogmore House is located. These places are open at various times throughout the year. If it is open when you are there do stop by, the gardens circle a lake making a tranquil setting. The mausoleum is beautiful with detailed architecture and marble work. Frogmore House, a favorite retreat of the royals since the late 1700s is another wonderfully preserved historic home giving one a good glimpse into the royal lifestyle. Returning to the Long Walk, you venture further into the Great Park, the walk terminates in the park at the Copper Horse that you can see from the beginning of the walk. If you like to walk and want to get a good feel for a truly wonderful park, spend the day in the Great Park. The views from the Copper Horse are worth the walk; on a clear day, you can see all of the Thames Valley below. There is a wonderful area reserved for the royal deer that are magnificent with prominent antlers atop their heads; there are lakes and 500-year-old oak trees that look like they just stepped out of Sleepy Hollow. Several quaint little villages complete with village greens abound in the park. If you like gardens the Savill Garden is one of the best you will see in the countryside. There are also Roman ruins, a statue of Queen Elizabeth on her horse completed for her recent jubilee and some stately royal residences. The Great Park is also home to the royal cows, sheep and vegetable gardens used by the Castle. Windsor and Eton both have some good restaurants so if you opt to stay in town for dinner some good spots along the river include, Browns for a moderate priced dinner, the House on the Bridge and Monty’s (last 2 on the Eton side of the river). Both Brown’s and the House are a little slow on the service side. We like the Spice Route just off the High Street in Windsor near Starbucks for fantastic Indian food by one of the TV chefs and Thai Square near the Windsor Theatre. And speaking of the theatre, if you want a real slice of British life, attend one of the performances here. It is top notch theatre in an intimate historic setting (not a bad seat in the house). Many West End shows stop here before moving to the West End. The best of Noel Coward, Oscar Wilde, Jane Austen, and many modern English playwrights works are performed here. If you are ready to take to the road, there are a number of day trips you can make from Windsor. And if you would rather take the train, Windsor has 2 train stations and a very quick 10-minute ride to Slough, where connections abound to places like Oxford and Stratford-upon-Avon. But for now, we’ll focus on driving. Our first trip takes us to the town of Richmond, about a 30-minute drive to Hampton Court Palace. This was a former palace of Henry VIII, it has a delicious blend of Tudor and Classical interiors depending on the monarch’s taste after Henry. The gardens are outstanding and include a maze. Most all of the palaces and country houses on tour have gift shops and tearooms for cream teas and light lunches. Also in the vicinity are Marble Hill House and Ham House, well-preserved houses of the nobility from the 18th and 17th centuries respectively. To get a different feel of the countryside you should devote a day to the Cotswolds, up the M40 toward Oxford. This is one of the most romantic parts of England. The blond stone buildings with slate roofs, the stucco thatched roof cottages, gardens blooming behind every building, window boxes bursting with color are a few of the thoughts that come to mind. Sitting on the edge of this wonderful escape is the stately Blenheim Palace, birthplace of Winston Churchill. This is about a 75-90 minute drive from Windsor. You could spend a good deal of time here touring the palace and the grounds resplendent with gardens, a maze, and a Capability Brown landscaped park. Built for the first Duke of Marlborough in the 18th century it is nothing short of magnificent. The current Duke still lives in a portion of the palace and when he’s away on holiday you can even tour his current residence. The history of the family has interesting ties to America and even Winston Churchill’s toy soldier collection is on display. You may have time to see one of the two Cotswold villages mentioned here or skip Blenheim in favor of both. Burford and Broadway are each about a 30-minute ride from Blenheim (every drive in the UK takes longer than you imagine due to the small roads and limited motorways). If you like antiques, art, nice restaurants and a charming atmosphere you will enjoy these two towns. Burford has changed little since Georgian times and was an important coach stop between Oxford and the West Country. Broadway truly gets its name from the wide street but is most picturesque. In the heart of town is the Lygon Arms, a worthy stop for high tea, and a peak at the outstanding architecture inside. Should you decide to spend the night, it’s a good bet and the restaurant is celebrated in the area. The third day I would recommend St. Albans and Woburn Abbey; take the M4 to the M25 to the M1. This trip will acquaint you with the Roman history of England. Here stood an important Roman settlement called Verulamium and the walls still stand as well as the foundations of a Roman Theatre. The Verulamium Museum is an excellent museum to glimpse this era with artifacts, mosaic floors and a Roman room painstakingly recreated. St. Albans Cathedral is also worthy of a look as it dates back to 1077 exhibiting Norman and early English architecture. From here head north to Woburn Abbey, home of the Dukes of Bedford. One of the great stately homes of England, it includes an important art collection including works by Reynolds and a large number of Canalettos. And for the antique lovers, the mews has been converted to an antique mall with quality antiques for sale. If you are ready for some Napoleonic history, the fourth day should take you west to Stratfield Saye, home of the 1st Duke of Wellington near Reading. The home has a fabulous entrance hall displaying much of the art and antiques taken from his victory over Napoleon as well as a fine Roman mosaic floor. The house is much the way it was in his time. Also on the property is a detailed exhibition of Wellington’s life enriching one’s understanding of a most important time in British history. The gardens are exceptional. From here it’s on to Newbury to see Highclere Castle, a building that bears a remarkable resemblance to Parliament and designed by the same architect, Charles Barry. This stunning residence is the home of Lord Carnarvon. The family has been prominent in history. The 5th earl along with Howard Carter found the tomb of Tutankhamen. An interesting Egyptian collection owned by him is housed in the basement of the house. The art lover will find many old master paintings here. And as all of the stately homes mentioned above, the antiques abound. The walled garden is said to have inspired the play ‘Secret Garden’. If you have more time in the Windsor area you will enjoy a day at Marlow and Henley. These lovely river towns are a pleasure to tour. Stop for lunch at the Compleat Angler, a hotel in Marlow with a good restaurant and river view. Another nice drive is to Aylesbury to visit the Rothchild’s Waddesdon Manor with naturally, a French flair. While you are up that way a great hotel for high tea is Hartwell House. This is also a super place to stay if you decide to try another country house hotel. The plasterwork in the public rooms is truly a work of art. The home served as the court of Louis XVIII during his exile from France. The last trip to mention is a day trip to Oxford. It’s a little more than an hour’s drive and well worth the time. The university is open most days in the mid-afternoon. The city abounds with outstanding architecture, interesting museums, shops, and good restaurants. We will have a detailed tour of Oxford included in a future narrative highlighting the Cotswold area only. Your trip through the Thames Valley will span history from the time of the Romans through the Tudors, the Georgians, and the Victorians. You will see a wide range of architecture, fabulous art collections and stately country homes full of antiques and loaded with history. We hope you enjoy it as much as we do living there.